LUCKY SEVERSON, correspondent: To say this was a big day for the Blackfeet Indians would not be saying enough. ERVIN CARLSON (President, Intertribal Buffalo Council and Blackfeet Nation Bison Program Manager): They were everything to us. They were our existence. They just—they kept us alive. SEVERSON: And now they’re back on the Montana reservation—87 bison, or buffalo as the Blackfeet prefer to call them, genetically pure descendants of the ones shipped away when the tribe was on its knees. 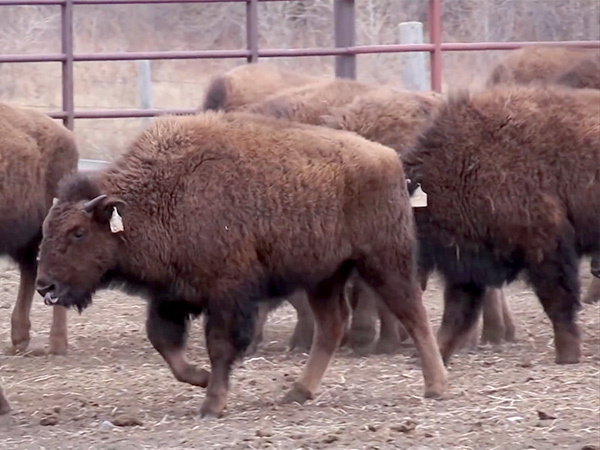 Keith Aune runs the Wildlife Conservation Society’s bison program that helped return the animals. KEITH AUNE (Senior Conservationist and Bison Program Director, Wildlife Conservation Society): That this animal was central to all of their being, and so their stories, the myths, the beliefs they have are all wrapped around this business of their relationship to iinnii or iinniiwa, as the Blackfeet call them. SEVERSON: When the buffalo were returned home to the Blackfoot Nation here in northern Montana after more than 140 years, it was seen by Blackfoot leaders as a very significant event, a new beginning, a renaissance, a way to restore a culture that was practically decimated physically and spiritually by the near-extinction of the buffalo. Today the Blackfeet Nation consists of three smaller tribes in Canada and the larger one here in the US. The little town of Browning, Montana, near Glacier National Park is the center of the reservation where the buffalo were returned. The chairman of the tribal business council is Harry Barnes. 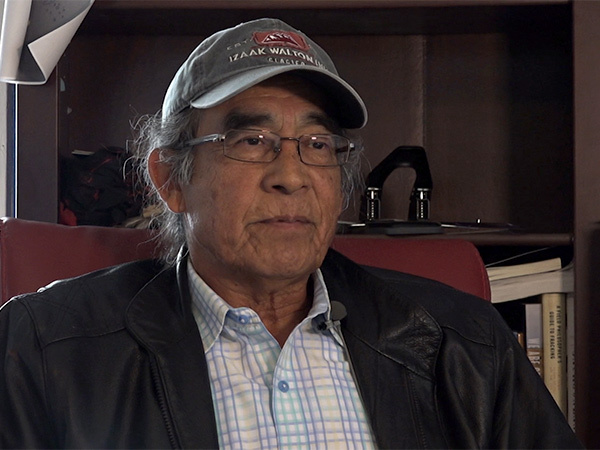 HARRY BARNES (Chairman, Blackfeet Tribal Business Council): When we lost the buffalo in the 1870s it caused a dramatic change in our society, a monumental shift in everything. The buffalo was always part of our daily life. It was in front of us, it was behind us, it was around us. 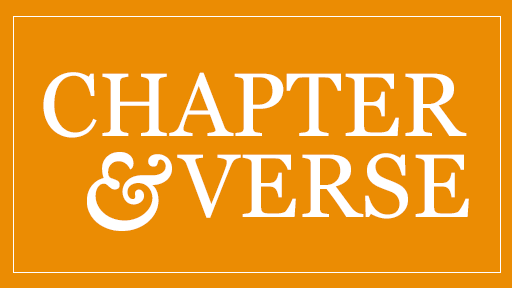 It created our shelter, our clothing, and so that was an integral part of us, and then after we lost it, then had to—it was a major shift in our spirituality. 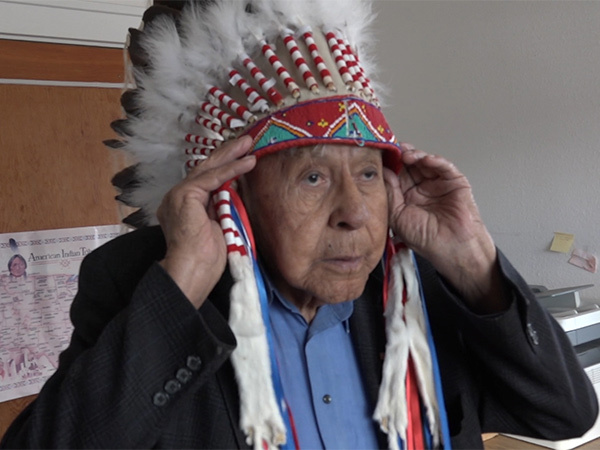 CHIEF EARL OLD PERSON (Blackfeet Nation): They prayed to him, the buffalo, talked to him. SEVERSON: Earl Old Person is the longest running chief in the US. He was actually named Old Person as a baby. He’s said to be about 87 years old. Chief Old Person has lived the culture, the traditions, the songs. When our old people that’s left, when they hear these songs it makes them cry, because that was their way of life. 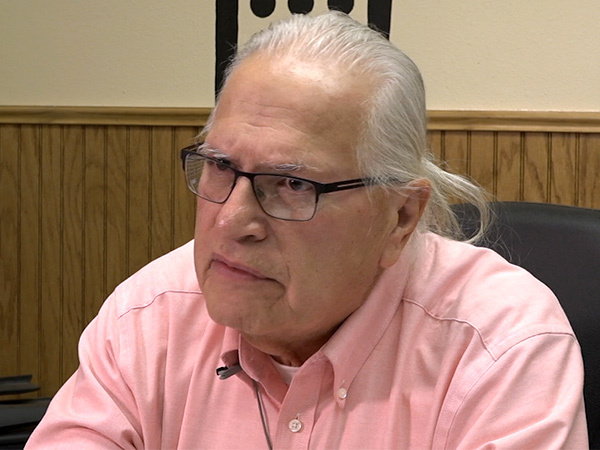 SEVERSON: Ervin Carlson is president of the Intertribal Buffalo Council. ERVIN CARLSON: They’re just a part of our being, our spirituality—I mean, not only the buffalo, but all of the animals are very spiritual to the Indian people. SHELDON CARLSON: Everything we pray to is what Creator made. That’s a grasshopper, that’s a beetle, that’s an ant. The all have a spirit, they all have a life. SEVERSON: The rock has a life? SHELDON CARLSON: Right, rock has a life, yeah. SEVERSON: Blackfeet like Sheldon Carlson embrace a religious system that grew out of 10,000 years of experience with nature. The beaver bundle is an example, a bundle of treasured remnants from their natural environment, like an antelope skin, that’s passed down through the generations. SEVERSON: With you religion is here, there, everywhere all the time. SHELDON CARLSON: We pray pretty much every day. I get up in the morning and light my smudge and pray over the beaver bundle. SEVERSON: Sheldon Carlson spends just about every day with the buffalo, with the old herd and the new one. The difference is extremely important to the Blackfeet. The old herd of about 400, which the tribe has owned for several decades, is considered tainted because it had been in physical contact with cattle and elk. Ranchers fear that because of that contact the buffalo carry brucellosis, a reproductive disease. That’s why they’ strongly protest importing any buffalo. Keith Aune says their concerns are unfounded. AUNE: Well, there’s two things. They aren’t diseased, meaning they hadn’t acquired a livestock disease such as brucellosis or tuberculosis, but they also don’t have cattle genes, which some people are a little confused. Cattle genes don’t come from associating with cattle, because bison and cattle don’t like each other. 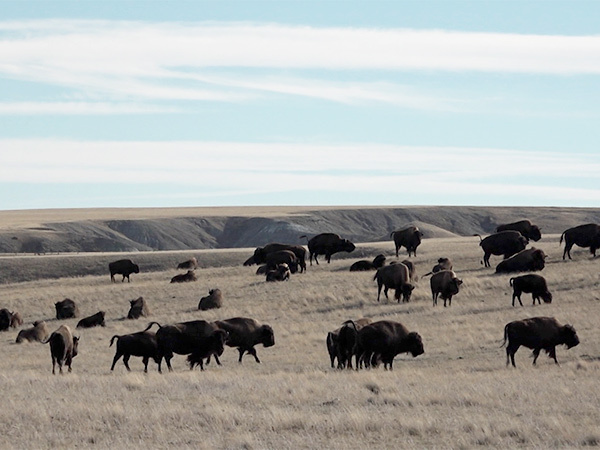 SEVERSON: The new herd is considered pure, because these buffalo have been kept on a remote preserve for more than a century by the Canadian government. 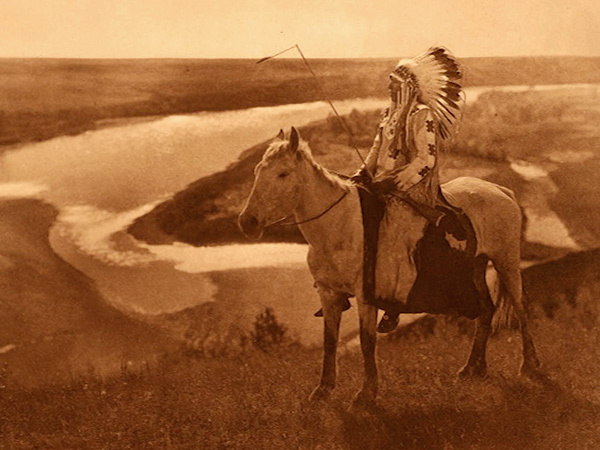 A historic treaty signed by several tribes in 2014 paved the way to return some of the herd to their original owners, the Blackfeet, long renowned as “hunters and gatherers.” But they were not prepared for the white man, who brought with him disease like smallpox that killed two-thirds of the tribe in the 1830s. The white men were much more sophisticated and duplicitous in drawing up treaties that were broken, one after another, squeezing the tribe into smaller and smaller spaces. AUNE: The more I study this and the more I understand our history, locally and regionally, there were some major atrocities that happened when these two cultures clashed, and part of those atrocities is things like the destruction of bison, which was intentional, which was purposeful, which was aimed at helping to subjugate native people. SEVERSON: At one point in the 1850s and sixties, there were an estimated 30- to 40-million buffalo roaming the Great Plains and the Intermountain West. The Blackfeet considered themselves prosperous. BARNES: So as long as we had the land and the buffalo and the rest of the animals we survived, we prospered, we were self-reliant, self-governing, you know, everything good we had. SEVERSON: But the white man had repeating rifles and were able to slaughter the buffalo on an industrial scale. And the US army played a role, too. General William Tecumseh Sherman ordered troops to shoot the buffalo until they became too scarce to support the “redskins.” Those were his words. By 1889, the millions of buffalo had been reduced to hundreds. Ninety-nine percent of the herds had been slaughtered. AUNE: They were just about gone, and it was just because a few people started to question this that a few animals were saved, and we today enjoy this full recovery of the species and are still working to see that happen in North America. SEVERSON: John Murray is a tribal historic preservation officer. 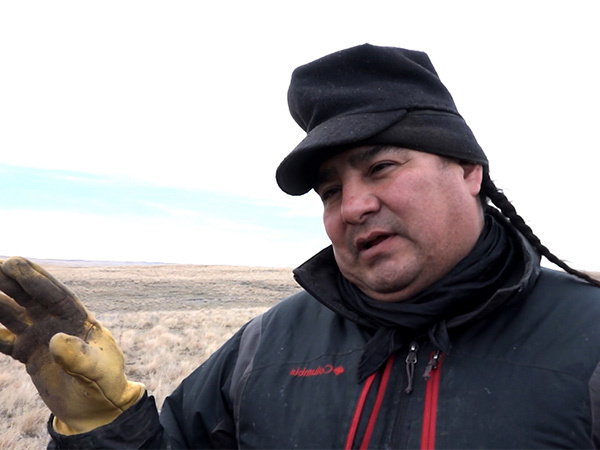 He says the loss of the buffalo affected the way the Blackfeet saw themselves. 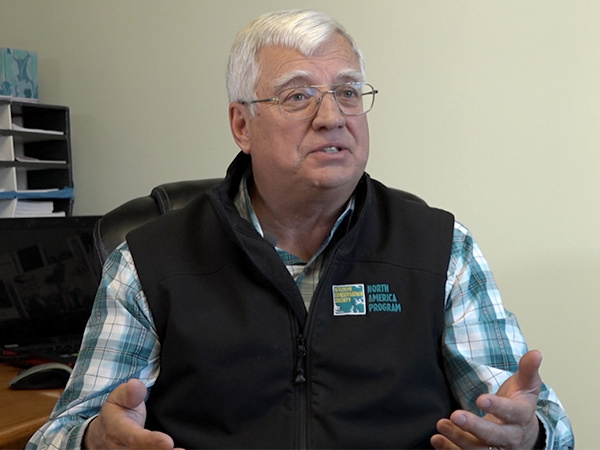 JOHN MURRAY (Blackfeet Tribe Historic Preservation Officer): In our situation there’s an outright attempt to eradicate our culture, and I think it was so effective the model of colonization with Blackfeet people, most a lot of Indians, that we’ve internalized it. BARNES: There’s a human pride, and not a Blackfeet pride or Indian pride. There’s a human pride in being able to care for yourself and your loved ones. We’ve lost that. SEVERSON: And that’s where this new herd of buffalo comes in. The hope here among the elders is that they will help restore pride, self-worth, and dreams among the young. SHELDON CARLSON: My goal is not just having a thousand. I’d like to see about 10,000. That’s what I’d like to see, and I’d like to see them just roaming free. SEVERSON: Thanks to a very recent decision by the Obama Administration, Blackfeet land that had been set aside for oil and gas leases has now been returned fully to the tribe—land that would allow lots of buffalo to roam free. MURRAY: When I was a younger person I started growing, letting my hair grow. People would say, you know, we thought you were a better man than that, you know. Cut your hair. The buffalo are never coming back. But they did. They came back, and they’re here, and we’re complete again. SEVERSON: It’s increasingly unlikely that John Murray will ever cut his hair short. For Religion & Ethics NewsWeekly, I'm Lucky Severson on the Blackfoot Indian Reservation.